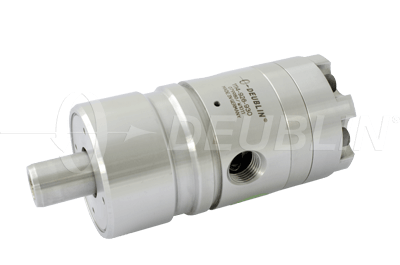 DEUBLIN offers five different seal technologies, in order to provide the best solution for every machining application. Only Deublin can offer such flexibility to the machine tool designer. As the name indicates, the seals stay closed with or without coolant pressure. Unions with closed seals have only minimal “weeping” of media to allow lubrication of the seal faces. Therefore, drain lines generally are not required. Closed seal unions generally are less affected by extremely contaminated coolant than other designs. However, closed seal unions should not be rotated for an extended time if coolant fluid is not present. 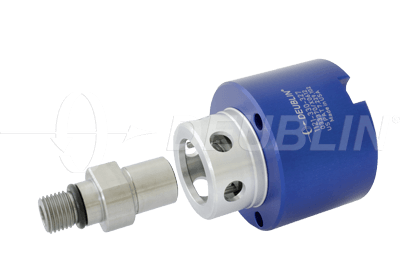 The opposite of closed seals, controlled leakage seals always have a small gap between the seals, even when pressure is applied. For this reason, controlled leakage unions are excellent for high-speed applications with pressurized dry air. Controlled leakage unions generally are not suitable for coolant fluid applications. This kind of seal closes only when pressure is applied. When pressure is removed, the seal faces separate by a very small distance. This eliminates friction and seal wear during operation without coolant, and therefore allows unlimited “dry running” at high speeds. Pop-Off™ designs should be considered when machining will occur with and without through-spindle coolant (TSC). 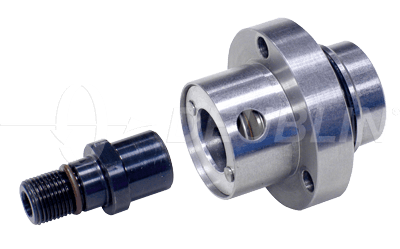 Because the seals separate during tool changes, when coolant pressure is off, residual coolant in the supply hose and spindle can drain through the seal faces. Therefore, a pop-off union generally requires a downward-pointing drain line to direct such residual coolant into the sump. Also note that Pop-Off™ unions are not intended for extended operation with pressurized dry air. 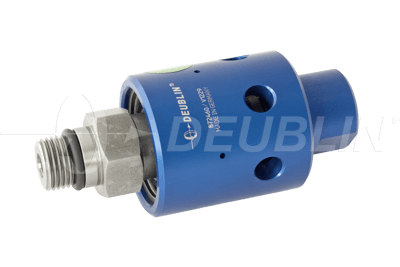 The latest in a series of DEUBLIN innovations, this technology combines the best features of Pop-Off™ and controlled leakage designs. Like Pop-Off™ designs, AutoSense™ seals close when coolant pressure is applied to contain the coolant fluid, and “pop” apart in the absence of coolant pressure to allow unlimited dry running. Like controlled leakage designs, AutoSense™ seals handle pressurized dry air by creating a microscopic gap between the seal faces. AutoSense™ unions handle coolant, MQL, and dry air, by sensing the kind of media and automatically changing seal operation in response. 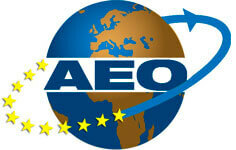 As with Pop-Off™ seals, a drain line generally is required. 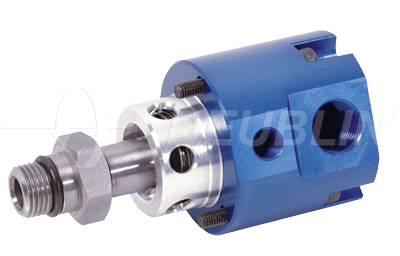 This technology gives the machine designer complete control over seal opening and closing. By controlling the how pressure is applied to the union’s multiple connections, the machine designer can cause the seals to separate when necessary (for example, to transfer pressurized dry air) or close when appropriate (to transfer coolant fluid or oil mist). A drain line generally is required. The table below summarises the operation of each seal technology with different media. (902, 1109, 1110, 1121, 1151 series) "All-Media"
(1114, 1124, 1154 series) "Controlled Leakage"